We are as likely to communicate using easily interpretable pictures as we are text. Portable handheld devices enable us to tell others via social media what we are doing and thinking. Approximately 15,000 years ago, we also communicated in pictures—but with no written language. The cave of Lascaux, France is one of almost 350 similar sites that are known to exist—most are isolated to a region of southern France and northern Spain. Both Neanderthals (named after the site in which their bones were first discovered—the Neander Valley in Germany) and Modern Humans (early Homo Sapiens Sapiens) coexisted in this region 30,000 years ago. Life was short and very difficult; resources were scarce and the climate was very cold. 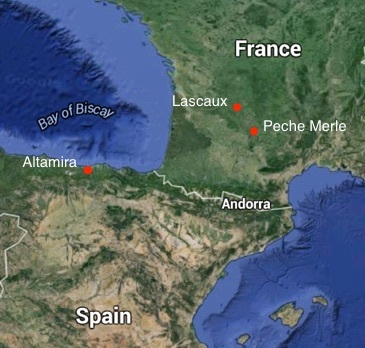 Approximately 15,000 years later in the valley of Vèzére, in southwestern France, modern humans lived and witnessed the migratory patterns of a vast range of wildlife. They discovered a cave in a tall hill overlooking the valley. Inside, an unknown number of these people drew and painted images that, once discovered in 1940, have excited the imaginations of both researchers and the general public. After struggling through small openings and narrow passages to access the larger rooms beyond, prehistoric people discovered that the cave wall surfaces functioned as the perfect, blank “canvas” upon which to draw and paint. White calcite, roofed by nonporous rock, provides a uniquely dry place to feature art. To paint, these early artists used charcoal and ochre (a kind of pigmented, earthen material, that is soft and can be mixed with liquids, and comes in a range of colors like brown, red, yellow, and white). We find images of horses, deer, bison, elk, a few lions, a rhinoceros, and a bear—almost as an encyclopedia of the area’s large prehistoric wildlife. Among these images are abstract marks—dots and lines in a variety of configurations. In one image, a humanoid figure plays a mysterious role. The animals are rendered in what has come to be called “twisted perspective,” in which their bodies are depicted in profile while we see the horns from a more frontal viewpoint. The images are sometimes entirely linear—line drawn to define the animal’s contour. In many other cases, the animals are described in solid and blended colors blown by mouth onto the wall. In other portions of the Lascaux cave, artists carved lines into the soft calcite surface. Some of these are infilled with color—others are not. The cave spaces range widely in size and ease of access. The famous Hall of Bulls (below) is large enough to hold some fifty people. Other “rooms” and “halls” are extraordinarily narrow and tall. Archaeologists have found hundreds of stone tools. They have also identified holes in some walls that may have supported tree-limb scaffolding that would have elevated an artist high enough to reach the upper surfaces. Fossilized pollen has been found; these grains were inadvertently brought into the cave by early visitors and are helping scientists understand the world outside. Given the large scale of many of the animal images, we can presume that the artists worked deliberately—carefully plotting out a particular form before completing outlines and adding color. Some researchers believe that “master” artists enlisted the help of assistants who mixed pigments and held animal fat lamps to illuminate the space. Alternatively, in the case of the “rooms” containing mostly engraved and overlapping forms, it seems that the pure process of drawing and repetitive re-drawing held serious (perhaps ritual) significance for the makers. Many scholars have speculated about why prehistoric people painted and engraved the walls at Lascaux and other caves like it. Perhaps the most famous theory was put forth by a priest named Henri Breuil. Breuil spent considerable time in many of the caves, meticulously recording the images in drawings when the paintings were too challenging to photograph. 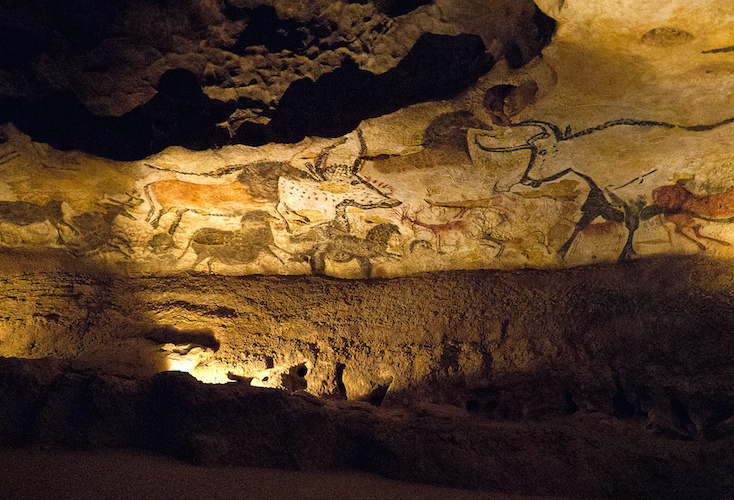 Relying primarily on a field of study known as ethnography, Breuil believed that the images played a role in “hunting magic.” The theory suggests that the prehistoric people who used the cave may have believed that a way to overpower their prey involved creating images of it during rituals designed to ensure a successful hunt. This seems plausible when we remember that survival was entirely dependent on successful foraging and hunting, though it is also important to remember how little we actually know about these people. Another theory suggests that the images communicate narratives (stories). 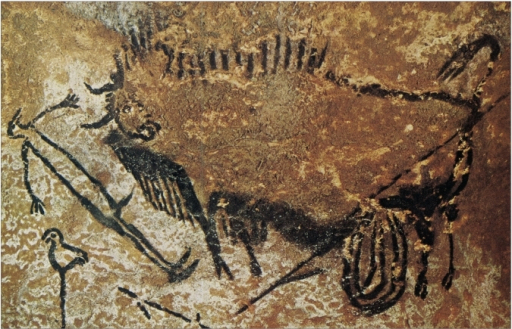 While a number of the depictions can be seen to do this, one particular image in Lascaux more directly supports this theory. A bison, drawn in strong, black lines, bristles with energy, as the fur on the back of its neck stands up and the head is radically turned to face us (below). Disemboweled bison and bird-headed human figure? Cave at Lascaux, c. 16,000-14,000 B.C.E. A form drawn under the bison’s abdomen is interpreted as internal organs, spilling out from a wound. A more crudely drawn form positioned below and to the left of the bison may represent a humanoid figure with the head of a bird. Nearby, a thin line is topped with another bird and there is also an arrow with barbs. Further below and to the far left the partial outline of a rhinoceros can be identified. Interpreters of this image tend to agree that some sort of interaction has taken place among these animals and the bird-headed human figure—in which the bison has sustained injury either from a weapon or from the horn of the rhinoceros. Why the person in the image has the rudimentary head of a bird, and why a bird form sits atop a stick very close to him is a mystery. Some suggest that the person is a shaman—a kind of priest or healer with powers involving the ability to communicate with spirits of other worlds. Regardless, this riveting image appears to depict action and reaction, although many aspects of it are difficult to piece together. The Caves of Lascaux are the most famous of all of the known caves in the region. In fact, their popularity has permanently endangered them. From 1940 to 1963, the numbers of visitors and their impact on the delicately balanced environment of the cave—which supported the preservation of the cave images for so long—necessitated the cave’s closure to the public. A replica called Lascaux II was created about 200 yards away from the site. The original Lascaux cave is now a designated UNESCO World Heritage Site. Lascaux will require constant vigilance and upkeep to preserve it for future generations. Many mysteries continue to surround Lascaux, but there is one certainty. The very human need to communicate in the form of pictures—for whatever purpose—has persisted since our earliest beginnings. Gregory Curtis, The Cave Painters: Probing the Mysteries of the World’s First Artists (New York: Alfred A. Knopf, 2006). Cite this page as: Mary Beth Looney, "Hall of Bulls, Lascaux," in Smarthistory, November 19, 2015, accessed April 22, 2019, https://smarthistory.org/hall-of-bulls-lascaux/.